Here’s my latest for ABC’s The Drum on my recent trip to Jerusalem and the West Bank cities of Hebron and Bethlehem. 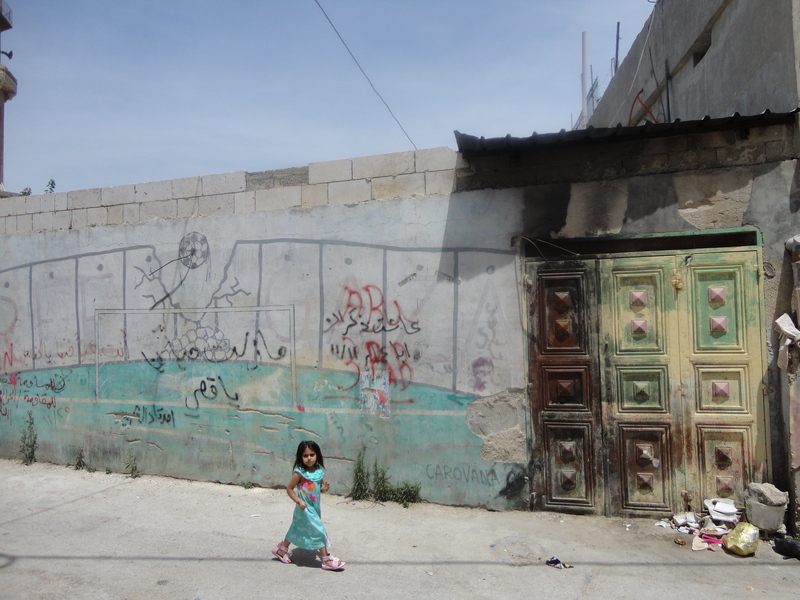 Little girl at Deheishe refugee camp near Bethlehem. It’s easy to feel removed from the continuous coverage of instability and violence in the Middle East. The never-ending conflict between Israel and Palestine has a depressing predictability that seems to blur into erupting cycles of deadly violence, acrimonious rhetoric and scenes of weeping mothers on both sides, paying the price in this seemingly intractable dispute. In the latest escalation, the kidnapping and murder of three Israeli teenagers found near Hebron in the West Bank last week sparked widespread calls for revenge, with protestors in Jerusalem chanting “death to Arabs”. A few days later, a Palestinian teen was burned alive in what is believed to be a revenge attack. Since the June 12 kidnapping Israel has meted out collective punishment on the occupied territories, raiding hundreds of homes and demolishing those of suspected kidnappers, launching airstrikes on Gaza and road-blocking Hebron, as Israeli prime minister Benjamin Netanyahu promised to avenge the deaths. Much of the media coverage focuses on covering bursts of conflict in a vacuum, with little context or historical analysis. Rarely do you get a picture of daily life on the ground in the territories and the impact of Israeli military presence and settlements in the region. 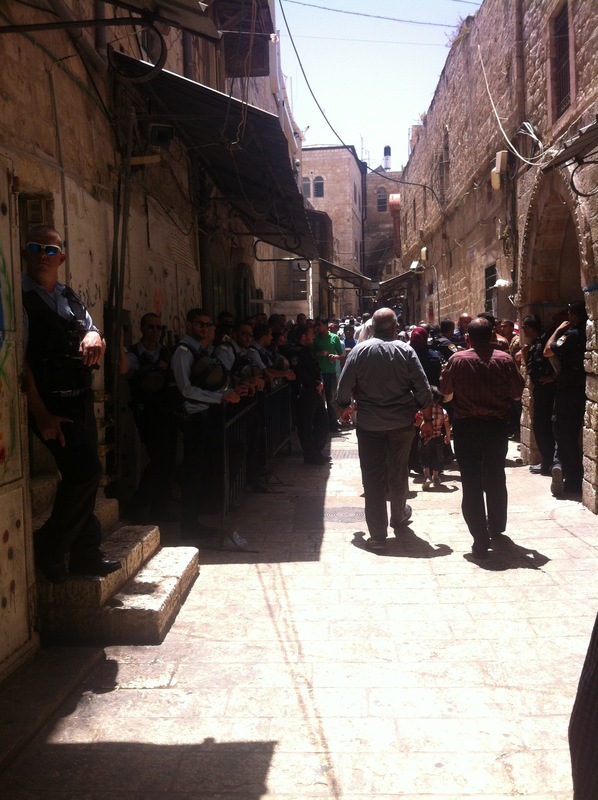 Hebron market vendor speaks about harassment from settlers who live above Hebron market. 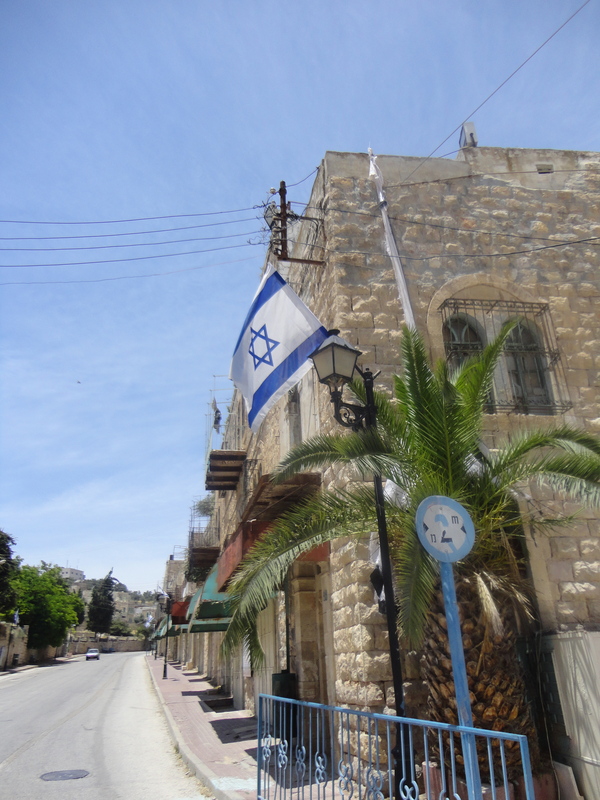 Two months ago I was in Jerusalem and from there visited the two largest Palestinian cities in the West Bank – Hebron and Bethlehem. My entry into the most contested piece of real estate in the world was met with a six-hour detention, where I was questioned and interrogated along with dozens of westerners attempting to enter Israel. We watched two young Palestinian-American men, turned back and banned for five years. One of the boys, a medical student intending to volunteer at a Jerusalem hospital was told he didn’t have required embassy permits to volunteer. During my stay, I have never seen more machine guns waved in my face or had my passport checked more often in my life. Young IDF soldiers with machine guns casually slung around their shoulders control access to holy sites, including the Dome of the Rock, the third holiest site for Muslims. Soldiers at Al-Aqsa entry gate at Friday prayer, Jerusalem. Checkpoints to enter are dotted around the mosque. 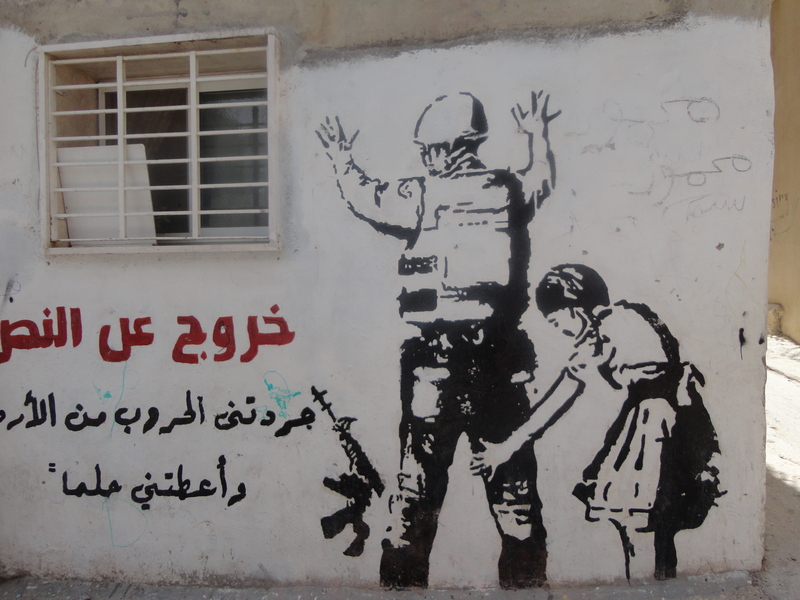 Along with many Palestinians, I got used to daily questioning as I entered. Sometimes I had to recite Quranic verses to prove I was Muslim, other times I had to show my passport. On Friday, the checkpoints are packed with soldiers and clashes are common as young men are arbitrarily turned away for juma prayer. In Hebron, where among 160,000 Palestinians, about 700 Jewish settlers live, protected by hundreds of IDF soldiers, a steel mesh dotted with garbage covers an open air Hebron market. Wire mesh covering Hebron market. 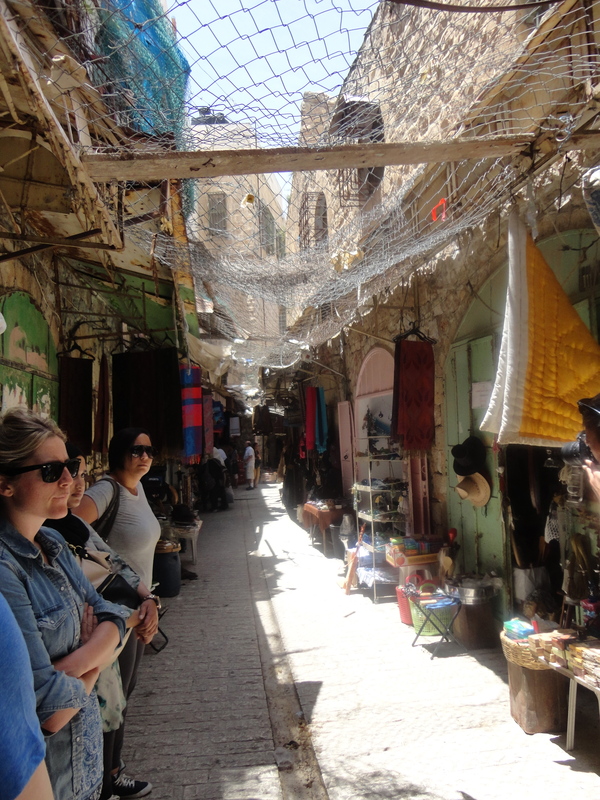 When I asked what it was for, the Arab vendors told me the the mesh protects them from urine, faeces and rubbish thrown down by settlers living above the market. 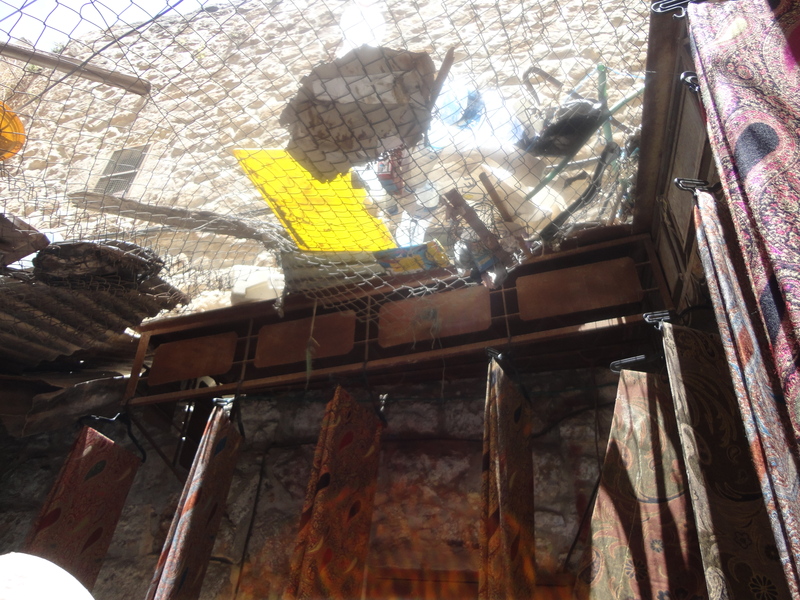 Rubbish in wire mesh covering Hebron market. The feeling of being contained continues in Bethlehem as we weaved our way through a confusing array of zones and checkpoints to visit the Separation wall. 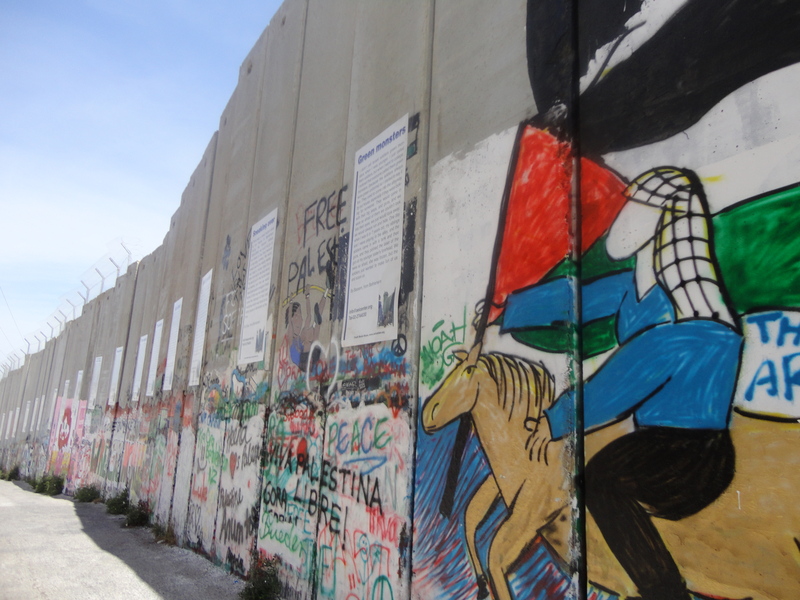 The massive eight-metre high concrete block, covered in protest graffiti snakes its way through huge sections of Palestinian territory, along with Israeli-only roads and checkpoints that bar Palestinians from Jerusalem. Water tanks dot the rooftop landscape to deal with fluctuating supply, as Palestinians are forced to buy back water diverted by Israeli pipes at inflated prices. I saw this in the scared faces of some the very young IDF soldiers conscripted for mandatory service and the aimless children in the refugee camp bound to grow up as angry teens. As the rhetoric of dehumanisation continues, it’s clear no one feels safe as innocents continue to suffer.